We’ve been eating a lot of seafood during very hot weather over the last few weeks. Yesterday I smoked a rainbow trout with 1/3 cup each of green tea, brown sugar and jasmine rice. I use an old wok lined with a few layers of alfoil and a circular wire rack to sit in it. I use a portable gas cooker and do it outside! 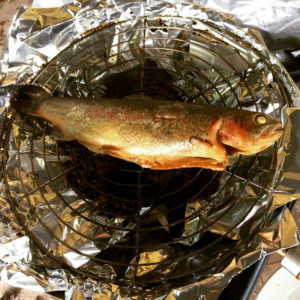 I put some sea salt on the trout and smoked it for 45 minutes, then wrapped it in foil and put it in the fridge. I later warmed it in the oven. I just bought some cooked prawns. The seafood sauce was simply blitzed roast capsicum. The seafood needed some lemon as well, which I realised I could have put in with the capsicum. 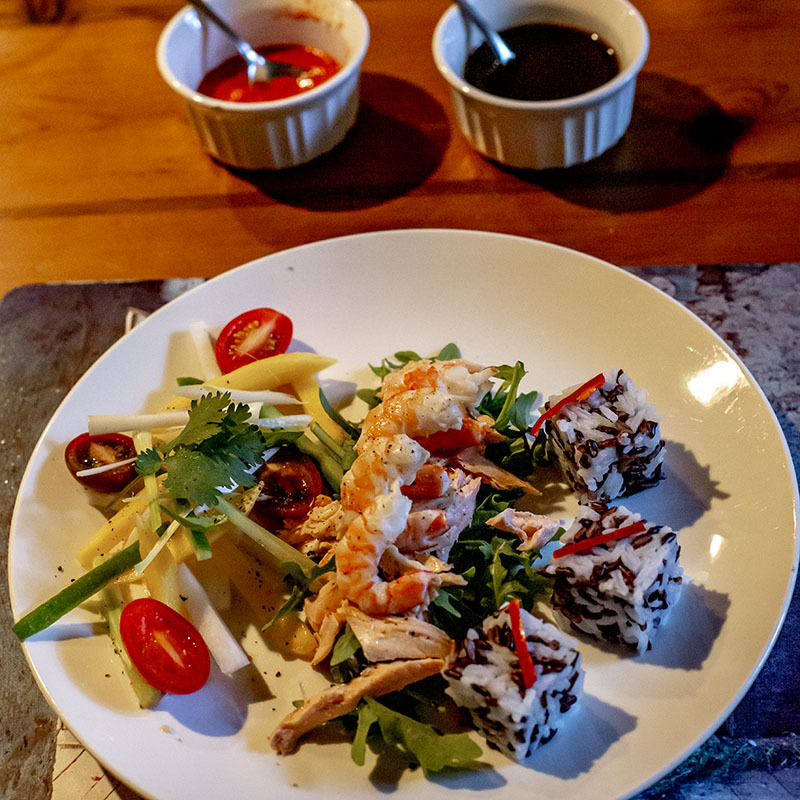 A mixture of wild rice and jasmine rice topped with a sliver of chilli, cubed with my rusty rice cuber. Salad of daikon rasish, cucucmber, mango, spring onion, cherry tomato, coriander and basil. Kwong’s “Recipes and Stories”. The original recipe includes Chinese mixed pickles which I didn’t have. Put the above into a saucepan, bring to a simmer and cook for 4-5 minutes. Remove from heat and stir in 1/4 cup black vinegar. Here’s an excellent Kylie Kwong recipe from “Heart and Soul” that I’ve adapted slightly due to allergies in our family. Scrub mussels. Remove their beards. Rinse and drain. Cook in a wok with 1½ cups water, covered, until the shells open. This will only take a few minutes. 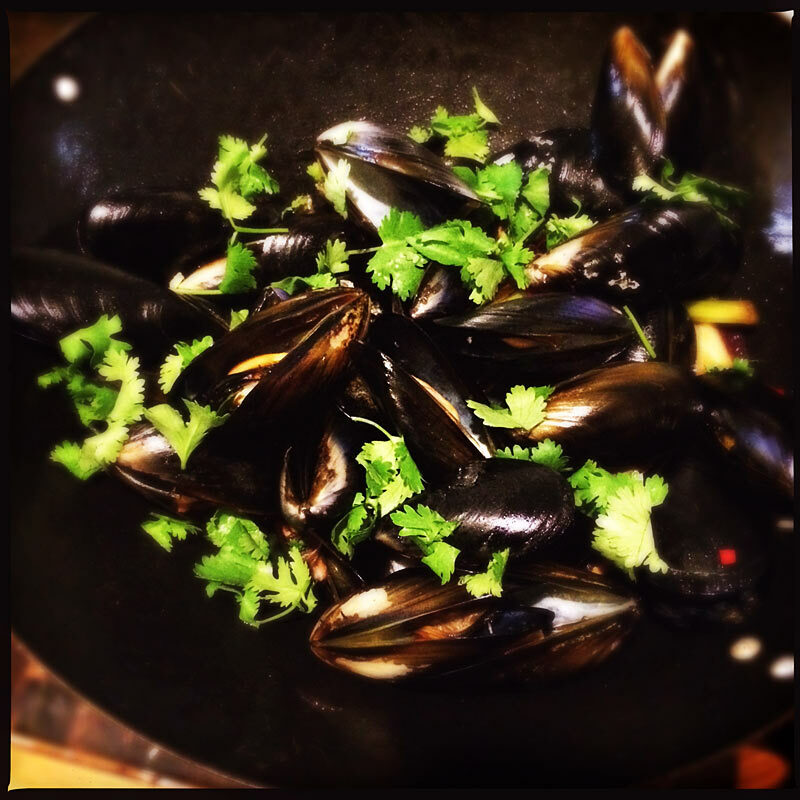 Immediately remove mussels from wok with a slotted spoon. Throw away any that haven't opened. Drain and clean wok. Heat 2-3 tbsp oil in wok and stir fry spring onion, ginger slivers, garlic, sliced chillies, onion and capsicum for 3 minutes. Add mussels and stir fry for 2 minutes. Add shao xing wine, sugar, oyster sauce. sesame oil and chicken stock. Stir fry for 3 minutes. Then add vinegar and coriander and serve.